He was an ardent WikiLeaks supporter. Then he got to know Julian Assange. A conversation with British journalist Andrew O’Hagan, former ghostwriter for Assange. Andrew O’Hagan was an ardent supporter of WikiLeaks, or at least the romanticized idea of it, when he began ghostwriting Julian Assange’s autobiography in January 2011. O’Hagan, one of Britain’s finest contemporary essayists, is passionate about speaking truth to power. He believed the world needed a transparency organization exposing power’s lies and abuses, such as those committed by the American and British militaries during the invasions of Iraq and Afghanistan. After years of in-depth conversations with Assange, O’Hagan came to believe that Assange had sabotaged the transparency agenda. The biography project collapsed before Assange moved into the Ecuadorian Embassy during August 2012, but O’Hagan tried to help Assange until late 2013. O’Hagan’s new book, The Secret Life, collects the Assange piece and two of O’Hagan’s more recent, detailed essays on modern times: “The Invention of Ronald Pinn” (about crime on the internet) and “The Satoshi Affair” (about Craig Wright, the Australian who claims he invented Bitcoin). The Secret Life is timely now, as WikiLeaks and Assange — essentially one and the same thing — are prominent in the headlines. This week, Assange tweeted support of an alleged NSA whistleblower who leaked documents to the Intercept. And Assange himself could be charged by the US government for publishing leaked documents. And then there are the sexual assault charges that Assange has been facing since 2010: Sweden recently announced that it is dropping its investigation. “I can conclude, based on the evidence, that probable cause for this crime still exists,” Marianne Ny, the lead prosecutor in Sweden, told reporters. 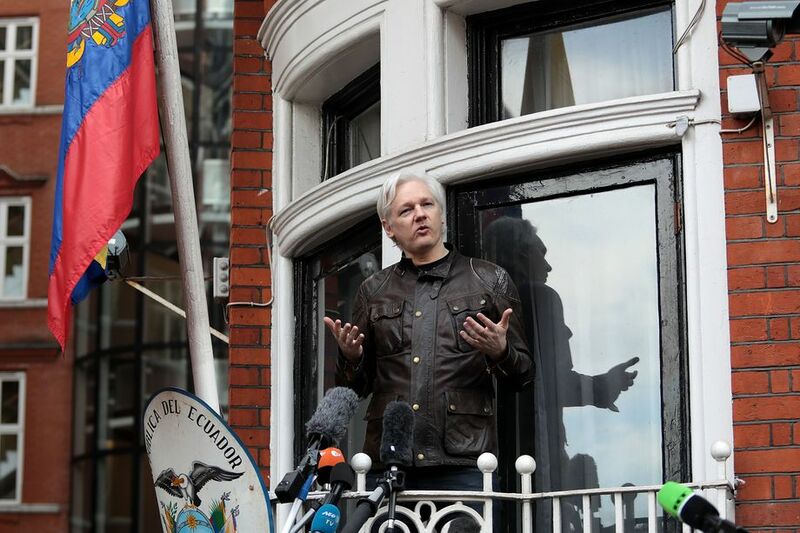 But because Assange has refused to cooperate with the investigation for seven years — and continues to hide in the Ecuadorian Embassy — they can’t continue investigating. O’Hagan and I talked about the Swedish allegations, Assange’s similarities with Donald Trump, and whether Ghosting was O’Hagan’s own Apocalypse Now. Our conversation, which has been edited and condensed, also covers Russia, Afghanistan, and the problem with cyber-libertarianism. Your Ghosting insider reporting is riveting and beautifully penned; I could quote half the thing. Julian once told you, “Every good story needs a Judas.” I would have been tempted to reply, “Does that make you Jesus then?” He seems to have a messiah complex. Look at so many of Julian’s offhand remarks; you don’t have to be Dr. Freud to see a power and victim complex. One minute he’s Jesus; the next minute he’s saying, “I want you to be my chief of staff,” positioning himself as the president. Every other day, he’s something of that sort. Were he an executive in a company, he would’ve been fired for a combination of mania and ineffective leadership very early. As would Trump, by this point. They share this too. They’re both embarrassingly mono-mined leaders with such a gigantic chasm where their empathy should be. The idea that each of these men are not only leaders but see themselves as being sui generis, one-off leaders of mankind, is absolutely flabbergasting self-delusion. They can’t speak to people. The idea of weakness obsesses them. Again and again, they fail to lead. What’s with [Assange’s] post-election shilling for Trumpism, and his taking the side of the neo-fascist Front National in the French election? I think it’s one of the weaknesses of the libertarian tradition: that they will go to bed with anyone, metaphorically. Julian has always claimed the relationship of WikiLeaks to its sources as being an invisible one, including to me. Look at his recent comments on the character of the sources. “It’s not Russia, I can say categorically!” he says. How can he say that if he doesn’t know? In other words, he is freely aware of the sources in both cases. And freely employing his skills as a selector and editor of materials; he’s shaping the material and shaping its public perception. I feel absolutely bamboozled that anyone would be as naive to imagine that promoting Donald Trump, seemingly in league with Russian forces, would be a freedom-fighting act. … This is the kind of person Julian decides to campaign for. And it is baffling and ruinous to the cause, his cause. James Ball, WikiLeaks’ former spokesman, writes that “WikiLeaks has never had a problem with Russia.” As in, they never objected to the Putin regime’s operations? James has strong sources for that; I do concur with that view. The idea that the gay-hating, misogynistic, criminal-industrial complex of Putin represents freedom — against the flawed model of the United States — is naive to the point of madness. And yet WikiLeaks has never had a problem with Putin, as James says. “He is thin-skinned, conspiratorial, untruthful, narcissistic, and he thinks he owns the material he conduits,” you describe Assange, “abusive and monstrous in his pursuit of the truth that interests him … he is probably a little mad, sad, and bad.” Any further thoughts since you wrote those words? Well, what has struck me very powerfully has been that many of those feelings that I left him with several years ago have, if anything, proved correct in the long term. I wrote those lines before his association with Donald Trump. I wrote them before the persistence of his staying in the Ecuadorian Embassy, rather than doing what I always suggested, which was to step out and answer all questions relating to the Swedish matter and clearing his name that way. Sadly, I now feel his name will never be cleared. The suspension of that investigation — which he claimed to be a victory — is not a victory for him. Nor for the women who raised the questions. … He’s exhausted an investigation by not appearing before it. That’s an unfortunate circumstance for someone who’s interested in being a champion of truth. I happen to have read the affidavits by the two women, the accusers in that case. I happen to think they were very weak. All the more reason, I felt, for him to go to Sweden and subject himself to as far-reaching a questioning and a process as possible. He had an opportunity to clear his name in a situation where the case against him was tremendously weak, in my opinion. And he failed! And not only failed but he committed what I think is an ethically disastrous act by conflating the request to answer those questions with the pursuit of him for espionage charges in the United States. The conflation of two separate issues has been a disaster for him. It’s been a sleight of hand morally that has robbed him of his previously high standing in my head. To stand in the balcony as he did, with his fist raised, as a freedom fighter, having “beat the system” and speaking of how he will not forgive is evidence of a man continuing to conflate these two separate issues. He was not on the balcony in a victory in a freedom fight. He simply eluded questions that were being put to him on behalf of two women who claimed they had been raped. The whole universe of WikiLeaks fanatics or people who are already on his side no matter what; support leaches away from him at that point. And anyone with any degree of public relations sense would have told him that. In early 2016, you predicted Donald Trump had a strong shot at winning the presidency. Here we are now — what a basic level of stupidity and desperation. Richard Nixon is Aristotle compared to Donald Trump. It’s abominable. How could we live in a world that goes from Obama to Trump being elected president back to back? We’re already in the footholds of an impeachment. Trump cannot survive his levels of carelessness. I learned from the years pavement-pounding writing The Secret Life’s stories that one of the things that binds these figures is their carelessness. It’s what somebody like Assange and somebody like Trump have in common: You get into a room, and they just run at the mouth. They’re so confident and self-involved they don’t understand that there are degrees of difference, of opinion, of experience. They’re mono-minded, and they don’t listen. Ultimately they’re careless. Trump doesn’t have the character to be president; carelessness will bring him down. Assange is similar, up to the present minute: His confidence, and his old fear of appearing weak, is fatal. How might The Secret Life surprise readers? The biggest surprise for me with these stories was the discovery that you can still find things as a writer that can’t be found in the crowdsourced world of online nonfiction. That old gladiatorial contact between a single writer and his or her subject can still be thrilling. It was thrilling to me, anyhow. And I think it might allow readers to see how writing itself can unearth truths. You wrote a scary essay on child jihadis. And The Illuminations, the novel about British Capt. Luke Campbell in Afghanistan. Both draw from your on-the-ground experience of that war as a reporter. What do you think will happen in Afghanistan during the next five years? It will fall into the hands of extremists. When I was there, I visited a girls’ school where the kids were trying to greet modernity through education. The Taliban came along and poisoned their drinking water. We failed those girls. We fail them every day. It was a lousy war because were pleasing ourselves in the way we prosecuted it; we understood nothing; we made things worse. The Secret Life reveals that Assange wanted his biography to read like Ayn Rand. You persuasively argue that cyber-libertarianism, favoring no restrictions on the internet trade of weapons and hard drugs, is dangerous. Wanting to throw stones through glass windows is an exciting notion. Particularly if behind those windows are corrupt officials, lying systems, deeply flawed institutions that have caused destruction. But when you look at the programs of so many of those cyber-libertarians, they’re actually just nihilistic; they don’t believe in any sort of society beyond the slightly autistic, involuted society of the web. And that’s what I really wanted to investigate when I set out to write this book. I find them right-wing. Their freedom is a slightly crazed form of freedom where anything is allowed, anything should be free. Nothing should be ordered. Those instincts led you to a place of an involuted chaos, of anarchy, where the monster ends up being in charge. They think it’s freedom; I don’t. I just think it’s preparation for totalitarianism. George Orwell kept his eye on this all his career. Speaking of great writers, Leo Tolstoy is one of your favorite (and most influential) writers. What do you think of his line “Everybody wants a revolution, but nobody wants to change their bad behavior”? I like that. Someday someone will write a great novel about the distance revolutionaries maintain between their ambitions for society and their ambitions for themselves. Many of those I’ve known love “humanity,” but they don’t really like people. You also write columns for [the] New York Times Magazine, where you’ve praised technology’s improvements to lives. Are you optimistic about AI and the future? I think life is just better because of technology. I’m not nostalgic for some imagined period of innocent bliss. It’s just nicer being able to order your carrots online and nicer being able to get information so quickly. AI is likely to be the biggest subject to have taken flight during our lifetime. It will change human experience and daily life immeasurably. And I can’t wait. You recently wrote a lovely tribute to Bob Silvers, the New York Review of Books’ late editor. What do you think about the future of editors and journalism? People will always want people to say something upbraiding and excellent. It’s like human conversation: We all like our computers, we all like bars, and we don’t always want to sit there alone, talking to ourselves. It’s lovely to think that someone might turn up and say an unexpected thing, things that will make your day, and for me the need for that will always be like the need for water. Let’s just say we irrigate the soul by means of each other, or we die before our time. Have you communicated with Assange since your initial essay came out in the London Review of Books during March 2014? I’m a great adherent of freedom of the press, like he is. In late 2013, I sent him the news that I would be exercising my freedom as a writer, speaking about our long relationship. This was three years after my ghostwriting interactions with him began. I made it known to him that this would be the end, goodbye from me, because there was never a possibility of Julian being able to accept others’ version of history rather than his, sustained in his own mind. “It was like trying to write a book with Mr. Kurtz,” you write about Assange in Ghosting — a reference to Marlon Brando’s difficult, perplexing character in Apocalypse Now. Was this your Apocalypse Now project? It was a bit like that. And the smell of napalm — I can tell you from hard-won experience — is slightly better than the smell of Julian in the morning. Alexander Bisley is a regular Vox contributor. He previously wrote about Julian Assange in 2013.